4Media PDF to PowerPoint Converter can convert PDF files to PowerPoint (PPT) presentations with original layouts, hyperlinks, images and tables retained in the created PowerPoint slideshows. With the PDF to PPT converter, you can convert certain range pages you specify. With the PDF to PPT creator, you can specify the PDF page range that you want to convert, only a few or all pages to convert. Moreover, the application preserves the original images, tables, hyperlinks and layouts in the generated PPT files after conversion. And it supports Microsoft 2010, 2007, and 2003. The PDF to PowerPoint converter allows you to load more than one PDF files and convert them one by one to PPT format files with great quality. 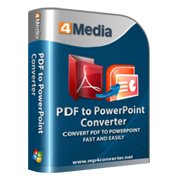 4Media PDF to PowerPoint Converter fully supports Microsoft PowerPoint 2010, 2007, 2003. Define the page range of PDF and convert them to PPT. This PDF to PPT Converter provides multiple languages interfaces: English, German, French, Spanish, Traditional Chinese, Simplified Chinese and Japanese.